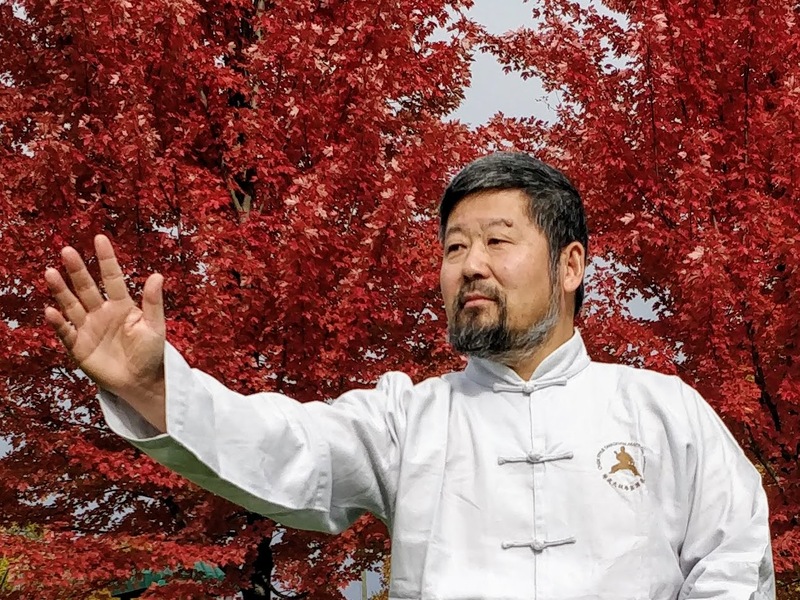 This section contains serious articles on all aspects of taijiquan. Our actions are like on the tangent of a circle. The non-moving dot is the centre of the circle. Every linear action is very small. The direction changes all the time. 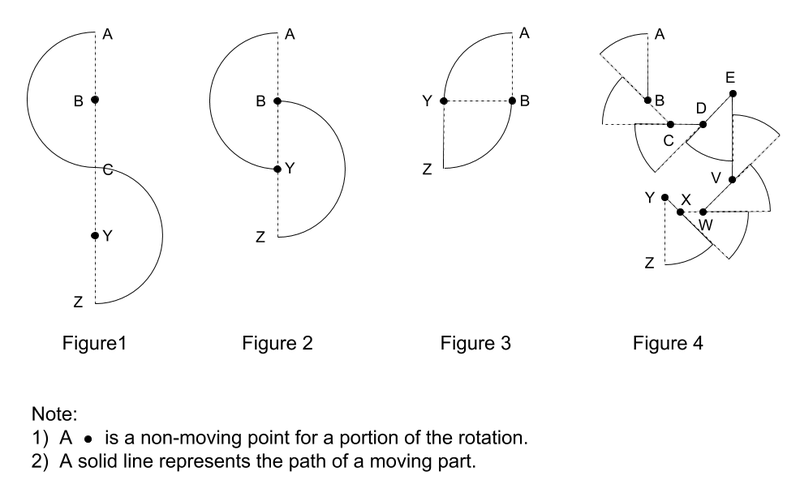 The sequence of such actions along with non-moving dot cause the rotation. The actions are continued on top of each other, and they have a relationship with the non-moving dot. In the form, it is like dragging the flesh around some non-moving rod or dot. It is almost like someone pushes the arm on one side for elbow in, and someone else pushes the other side of the arm for hand out. 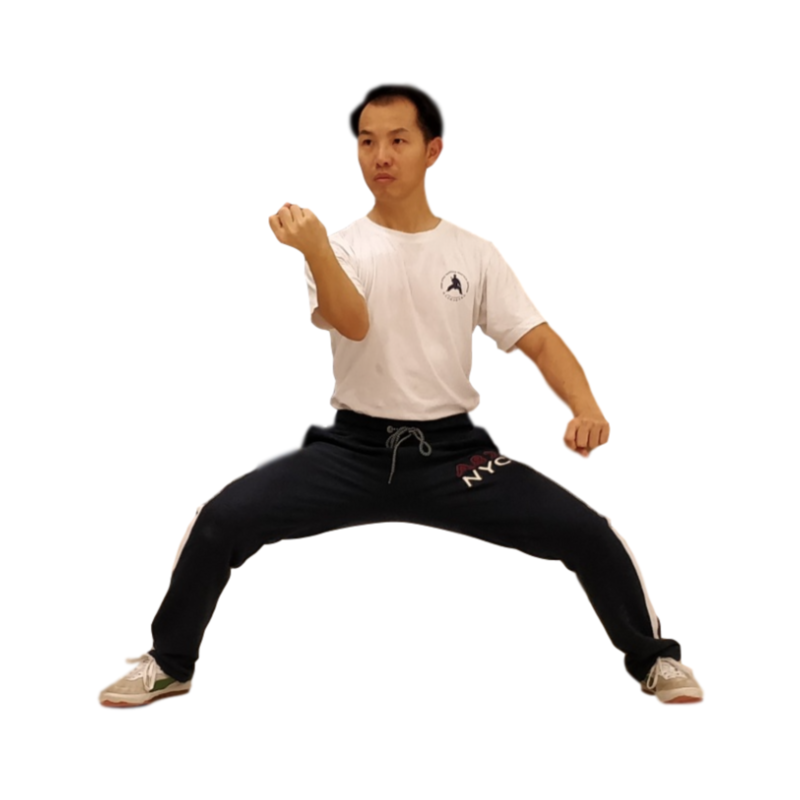 This is related to the stretch that Master Chen Zhonghua showed on the inside or outside of the forearm. Another example is that if someone touches me in the front, I don’t move the front, but I stretch the back over or around that non-moving front. Yi (intent) is not just a thought. 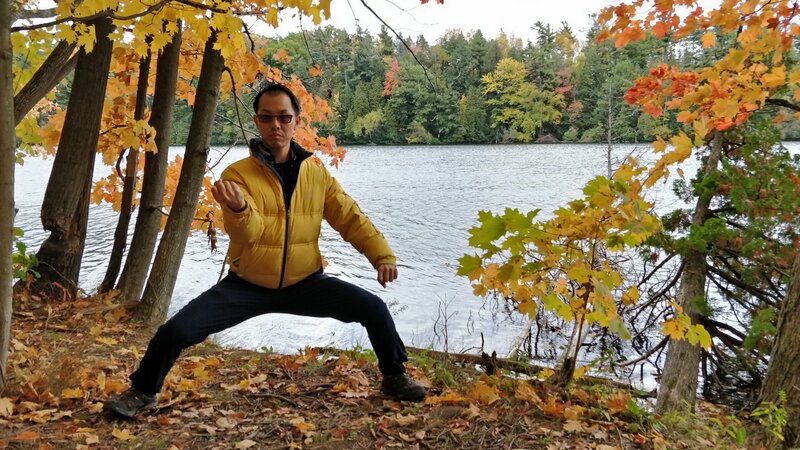 In my current understanding, yi describes an ability for your body to do a precise action as you command it to do. In other words, your body listens to your brain. It takes training to get to that state. Master Chen Zhonghua has said before, “the real intent is no intent”. Think about riding a bike as an example. After you have learned how to ride a bike, you don’t think about how to coordinate your hands and feet, how to balance, you only think about where to want to go. You appear to be able to do it with ease. 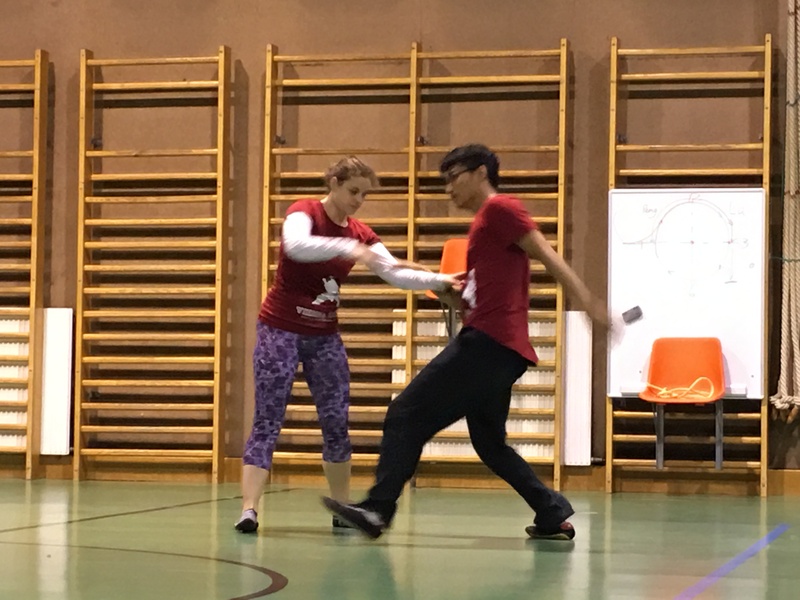 For taijiquan, we need to train long enough to make an action habitual, so that we don’t think about it when we need it, and it just comes out. To link movements together is to become double heavy. Instead of moving together, each body part must complete its’ designated role to complete a function. Desynchronized synchronization – first we must learn how to take our body apart before we can put it back together. Like a machine, the power only comes from every piece doing it’s job. One thing can only do one thing. The piston in an engine only moves up and down; it does not try to turn the wheel or to move the car forward. 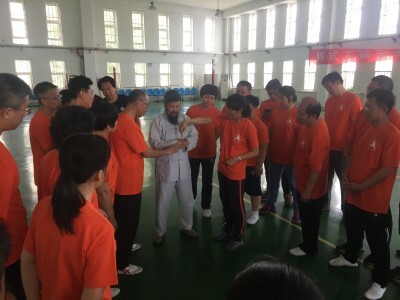 Within taijiquan, the machine does not fight. None of the actions of the body relate to fighting the opponent, only completing its’ designated job. Within a one dimensional movement everything is connected. For example, as the hand moves forward in a push, the torso also moves forward, typically followed by the rear knee. In this way, everything moves together in order to generate power, this power is generated by strength and expressed through speed. 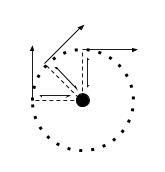 A two dimensional movement compounds the power of each body part by creating a non-moving piece. Each piece is able to successively ground off the last piece by creating a ‘wall’ to push off of. To create fewer or an unstable wall is to merge pieces together, resulting in power leaking out of the body or rebounding back. Power is dependent on the stability of the last piece. While we are learning to create this separation, our power is often not consistent enough to maintain the stretch. As we encounter power we revert back to a single dimensional push. A true two dimensional stretch is to maintain the separation despite obstacles. 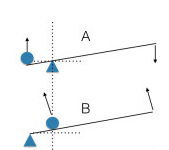 In the previous example of a push, a two dimensional movement would separate the arm from the body. As the arm pulls or pushes, the torso remains unaffected. The torso not moving creates a ‘wall’ that the arm is able to push off of. To be able to move in this manner is to move like a rotary saw. With a rotary saw the blade does not move on its’ own. The blade only rotates and spins, while the saw is pushed onto the wood. 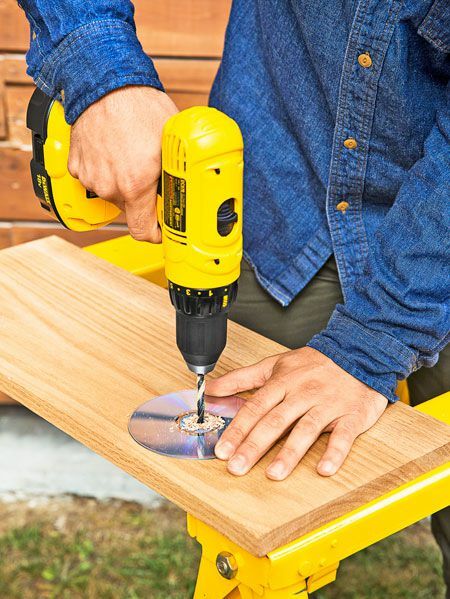 The cutting of the wood does not have to do with the blade rotating, it has to do with the wood being pushed onto the blade, or the saw being pushed onto the wood. The saw must move independent of the blade rotation – if the blade moves forward it is unable to rotate. Similarly, the torso does not move, only remains upright and rotates. The legs move the body forward/backwards, while the arms cut. Therefore we must find a method to define the separation of our movements. Separation of the body applies on both a macro and micro scale. Not only must we separate in the cardinal directions (top/bottom, left/right, front/back), but also differentiate the role of the hand from the role of the elbow; what the purpose of the front shoulder is vs. the rear shoulder, etc. Within Chen Style Taijiquan, an important aspect is that all our movements must be our own movements. We never move as a result of an external stimuli. This requires we bring extreme awareness to every body part – those which are moving and especially those which are non-moving. 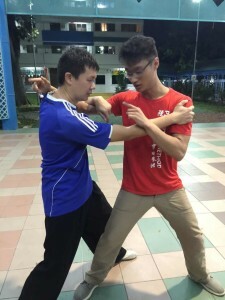 When we go out with the hand, we must not forget about the elbow; as the torso closes the distance, the hands can’t also be moving forward, etc. As soon as we engage with our opponent, we naturally want to fight power with power. This immediate response is something we must eliminate through our training. Learning to create a stretch within our body in the form and foundations, is to learn how to move past the point of contact. To never lose control of our body, even when engaging with an opponent, is to change our responses from a reactionary response to an active response. A reactionary response is to retreat back, and then move in; or to match their push directly with your own push. A push from the opponent does not result in a fight, or a retreat backwards. An active response it to decide where to move, and to go their of your own choice – not from the initiation of the opponent. If we are pushed and the shoulder moves back, we move not because we are pushed, but because we decide to move there. We must change from following the pace of the opponent, to leading our own movements. Within the rhythm of a fight, when you are able to dictate your own moves, the opponent will then follow (fall into rhythm). Movement is not a non-pressured release, but a pressured release like a hydraulic press where it must be evenly matched and paced (led). The intent of the movement is therefore only indirectly related to the opponent, and the decided movement is not at all resultant from what the opponent chooses to do – they are only an obstacle in place to overcome. This is a change from passive control over our body to active movement. To train this, we must train to never close, and to continue to stretch and expand in every movement of the form. As our understanding of Yilu deepens, body mechanics and details that we were previously unaware of become more and more important. But before we can focus on the small details, our understanding of positioning of the ‘big pieces’ must be precise – which is why consistent training of the full form is required. As we continue to train to open our joints, positions and movements that we were previously incapable of will allow us to improve our structure and power. I had an interesting experience lately. I took singing classes with a professional classical singer. It was only one single event, but I learned two important things in those one and a half hours which are not only reflecting back on my Taijiquan but also on my life in general. Everything is about intellectually understanding things. After listening to my singing for a short time and before the teaching started I got two or three pages of text describing how the breathing organs work and how those relate to singing. Doing Practical Method for a while now and being in contact with eastern learning methods I just skipped through the pages to see if there’s something useful. I asked the teacher whether knowing this stuff is of any importance, especially in the beginning. She said, being a little puzzled, that most people want to know what they are doing, first. Intellectually. I explained, that I do PM and I trust her as a teacher to lead me through exercises which she figures are important for me at my current state. She started teaching me. Unfortunately, I couldn’t find that setting during the remaining 15 minutes of the lesson. This moment, when the awkwardness was on its peek was the moment when the door opened. I didn’t step through it, but now I know it’s there, at least. Even if I would have find this door without the teacher, I would be convinced that it’s the wrong door. Many years ago when I was just learning Yilu, I had questions about how the “Second Closing” (the move after fetch water) was done properly. I was just imitating the movement, the hand was waving from one place to another place. I had no idea where was the energy alignment in that particular move. 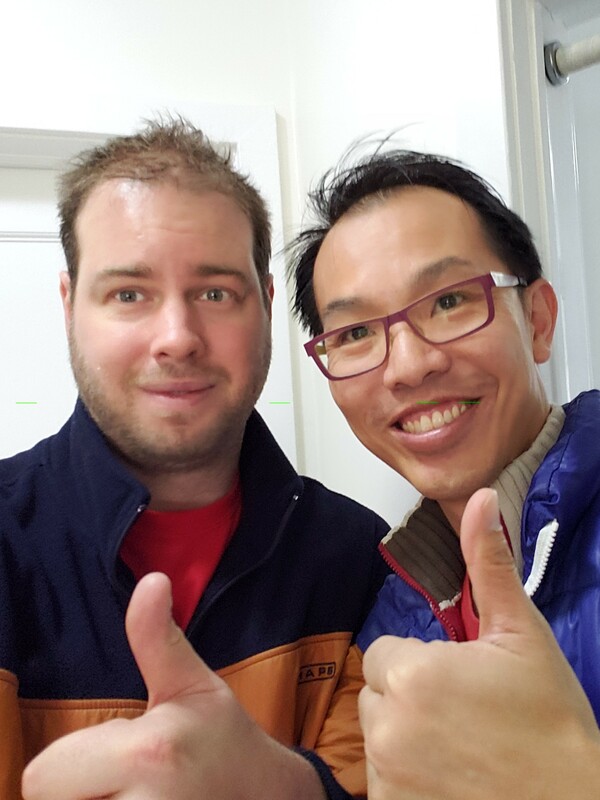 Master Chen explained “Second Closing” with its application and tried on me. He turned and I was on the ground. It was that simple. I didn’t know, I could not figure out how Master Chen did. But I did know how powerful the “Second Closing” was. Make sure you have annotations turned on for this youtube video. “Choreography is the first thing we learn. If we stop there we have a form that is ‘empty’. After we learn the basic choreography we must input alignment (tracks) and power. We all understand the importance of “don’t move” in Practical Method. To achieve “don’t move”, there’s a pitfall need to be aware. I believe that what happens to a connected person’s body when being pushed can be understood by understanding how a trampoline works. Any serious Taijiquan practitioner should develop the ability to listen and observe.